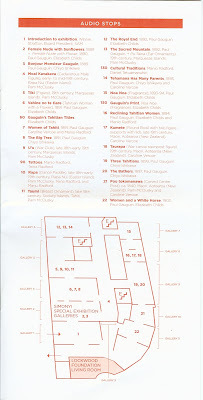 Chapter 1: 1884 - 1889. 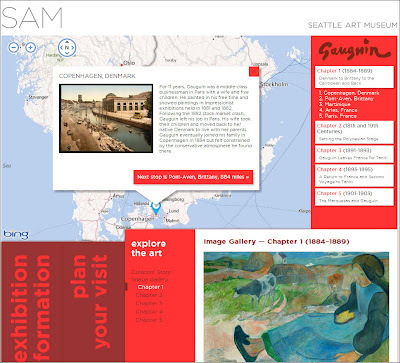 Gauguin is in Denmark and Brittany with a trip to the Caribbean. 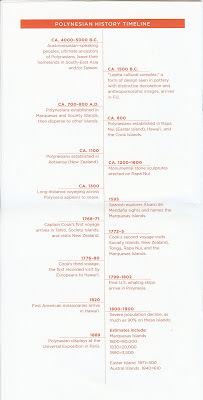 Chapter 2: 18th and 19th century Polynesian life. 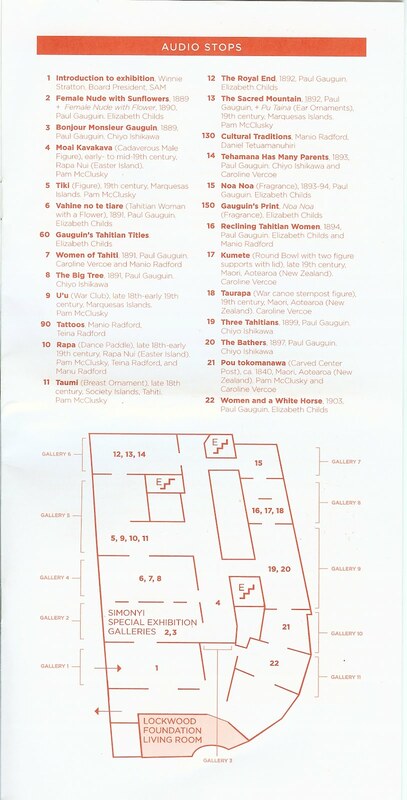 Not specific to Gauguin, but gives some context. Chapter 3: 1891 - 1893. 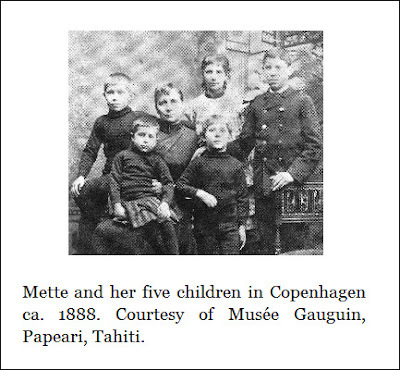 This is Gauguin’s first trip to Tahiti. Chapter 4: 1893 - 1895. 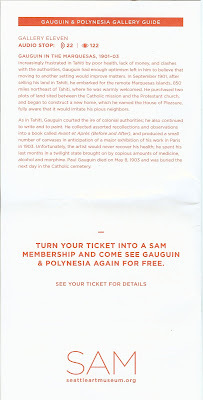 Gauguin returns to Paris and then back to Tahiti. Chapter 5: 1901 - 1903. 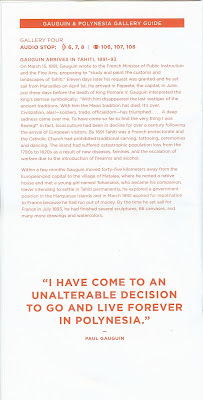 Gauguin relocates to the Marquesas Islands - the final resting place of Gauguin. 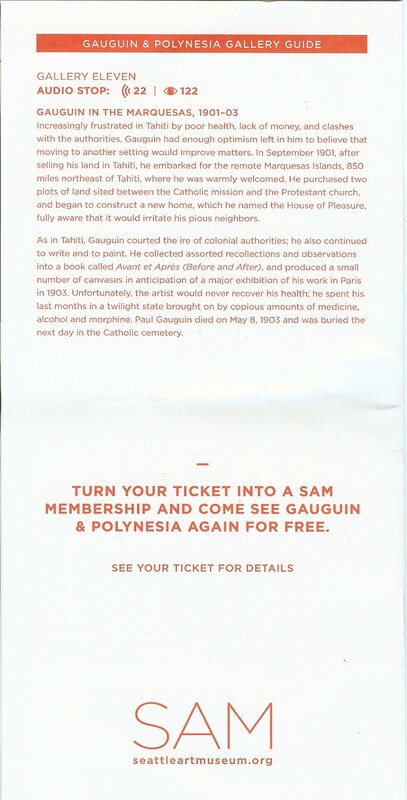 I must admit that we went into the exhibition lukewarm about Gauguin - oh that artist who left it all behind to move to Tahiti. 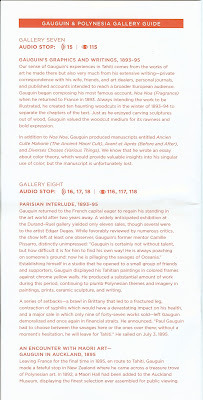 Coming out of the show we had moved into the negative in respect to our opinion about Gauguin. What about his wife and children and what about all the young Tahitian girls? 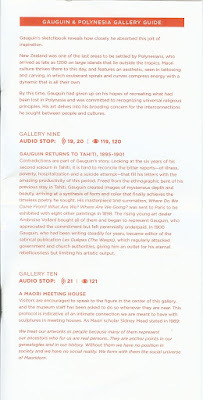 (Not even to mention Van Gogh’s ear!) 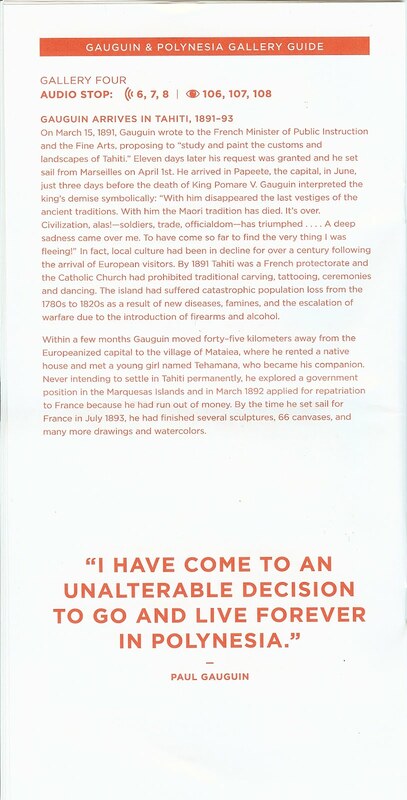 In short, we are probably the judgmental type of people Gauguin yearned to escape from when he sailed for Tahiti (twice). My negativity made me stop and reflect: what do I know about someone or something and where did I acquire that information. 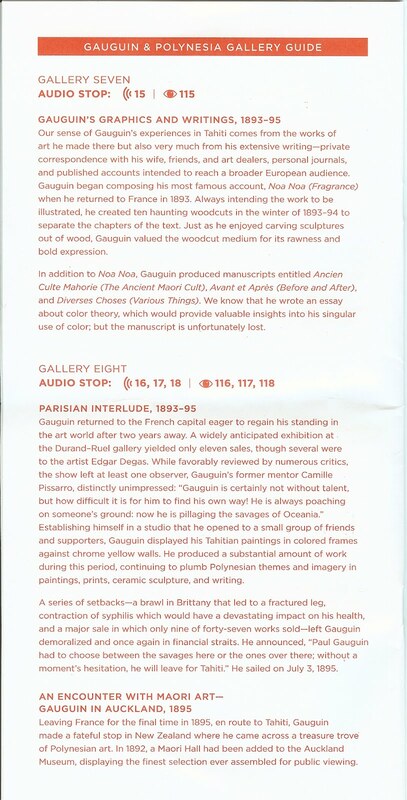 In the case of Gauguin, most of what I knew or believed about him was negative (an “egoist and madman”) and came to us from incidental sources. My judgment of his relationships with young Tahitian women, well, is based on where I sit 100 plus years later and not at all in his shoes. And so it is. The exhibition, Gauguin & Polynesia: An Elusive Paradise, will give you a better understanding of Gauguin, but will likely open up more questions than it answers - a good thing when leaving an exhibition, right? 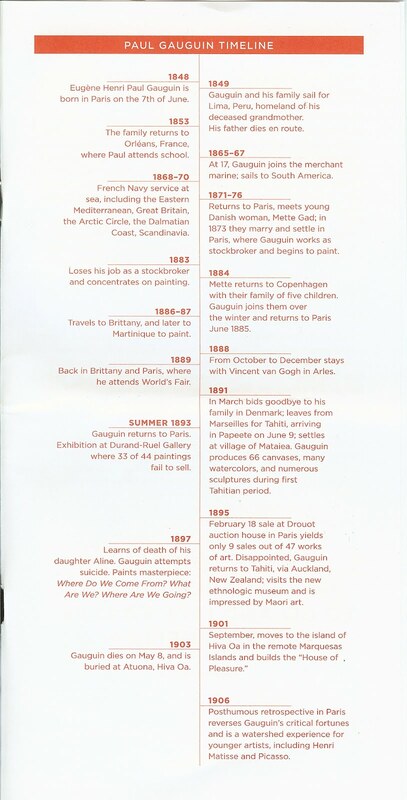 To address any uneasy feelings about Gauguin, I had to do my own research. The more I did, the more I discovered that the story told of his life was not quite the one I believed I knew. 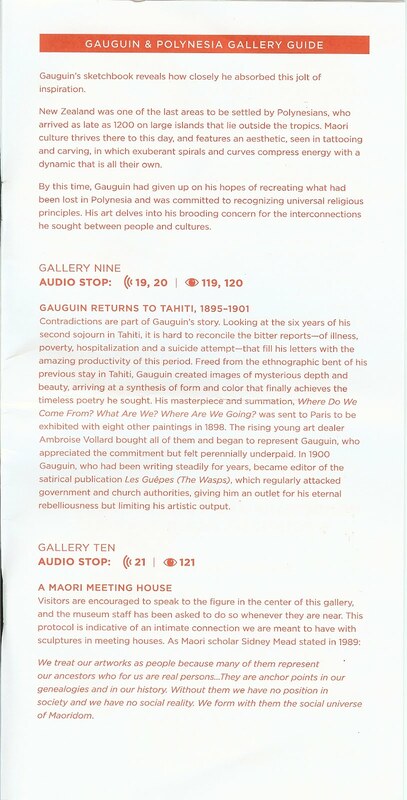 (In this respect, the documentary, Gauguin: The Full Story (2010), by Waldemar Januszczak looks interesting and I have yet to watch it.) 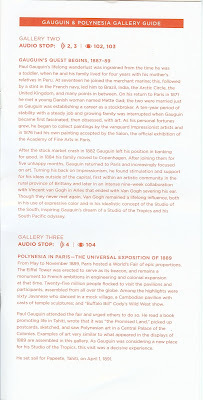 Needless to say, I am now a bit less critical of Gauguin (not his art per se, but with is lifestyle). In fact, I have a new respect for the lengths he went to searching for his happiness. 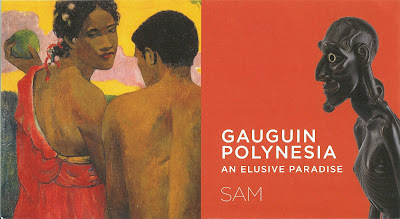 The Gauguin & Polynesia: An Elusive Paradise exhibition reminded me of the exhibition The Colour of My Dreams: The Surrealist Revolution in Art because it takes a well-known artist or movement (an artist in this case) and delves into influences on the artist. 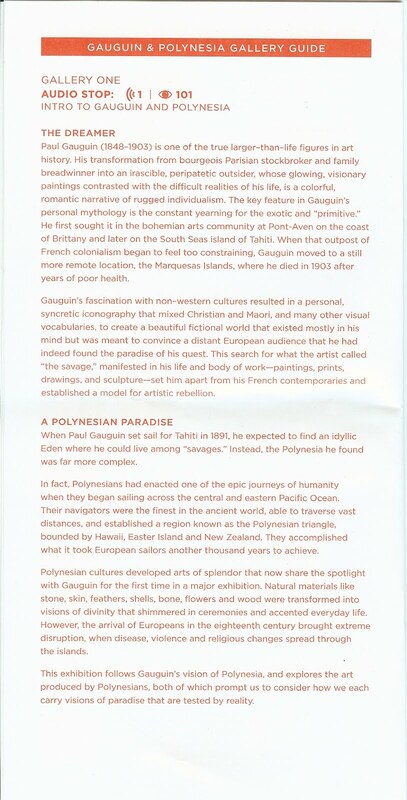 In Gauguin’s case it was primitivism and Polynesian culture. 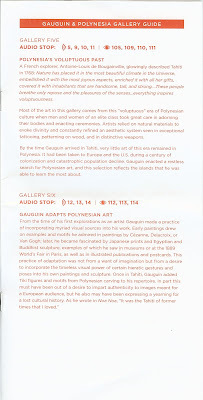 In the exhibition, there is a mixture of the artist’s works and Polynesian artifacts which may have influenced him. I am not sure this entirely works. Not that this approach isn’t appreciated, but it doesn’t seem to flow smoothly. 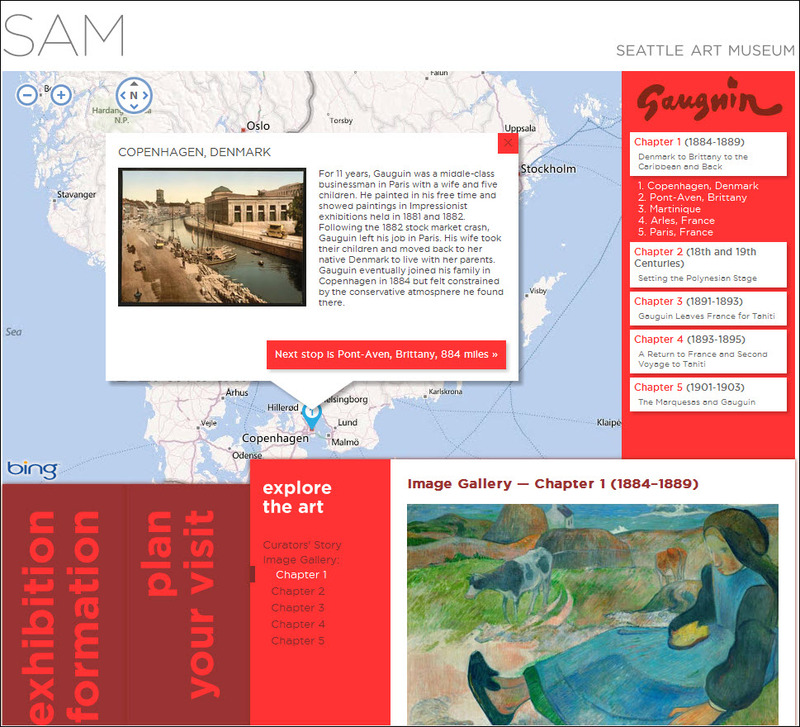 On a positive note, the digital material available at the Seattle Art Museum’s web site for the exhibition is excellent, a combination of video, timelines, and images. 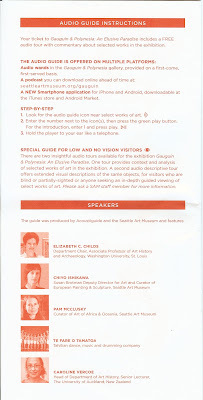 We reviewed the website and downloaded the audio guide to our phones before going. 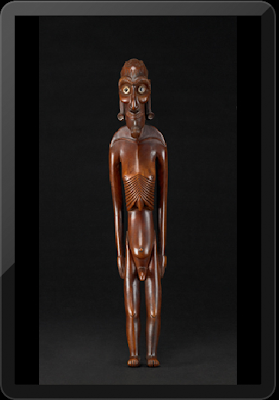 And to top it all off, the whole exhibition is available as a free iOS application (Acoustiguide SmartTours). 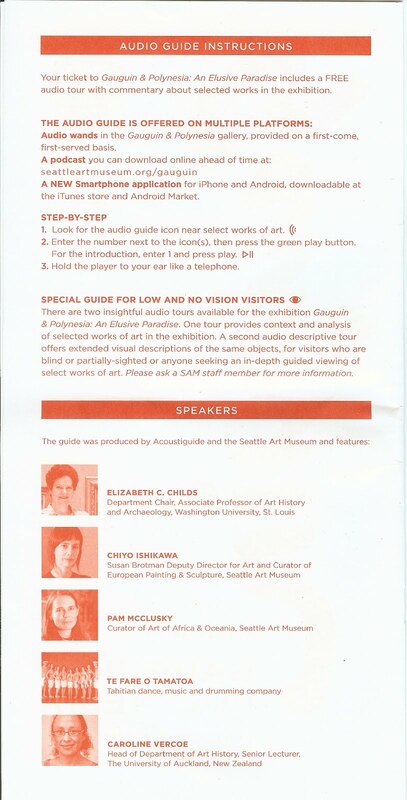 This is very handy for reviewing what we saw and experiencing the exhibit in another way. 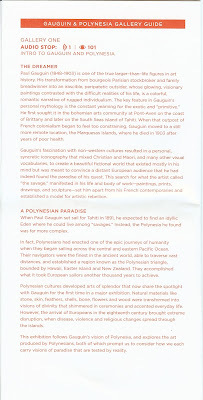 Polynesian Influences. 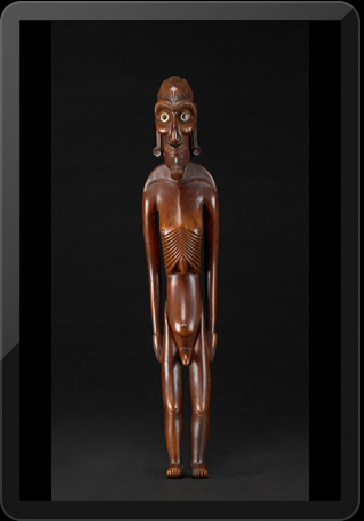 Image from left to right: 1)Pou tokomanawa (carved center post), ca 1840, wood and wax - Aotearos (New Zealand), Te Rai Rawhiti and Rongowhataata; 2) Kumete (Round Bowl with two figure supports with lid) late 19th century - Maori artis Anaha Te Rahu; 3) Moai Kavakava (Cadaverous Male Figure) - early to mid-19th century; 4) Rapa (Dance Paddle), late 18th-early 19th century, wood - Rapa Nui (Easter Island). 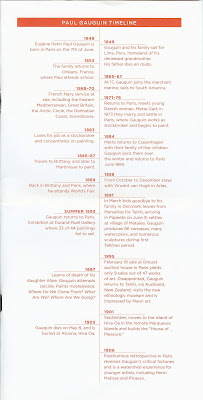 But in the last few years of his life, perhaps Gauguin missed Europe just a little? The ironic painting Flowers and Cats, 1899 depicts flowers from his European garden in the Marquesas Islands - grown from seeds someone had sent him. Had his life come full circle and he needed just a little of the European culture (a flower garden) that he was trying to escape? 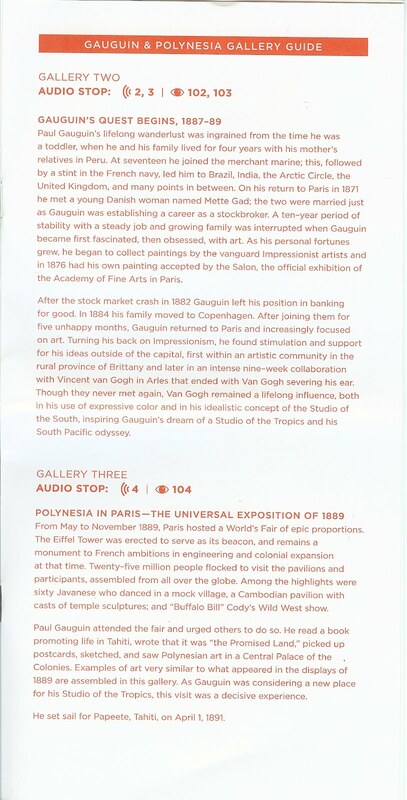 Also, the exhibition audio guide mentioned several times Gauguin’s desire to appeal to European tastes with his paintings - so he could sell them naturally - presumably to have the means to live comfortably or to help grow his fame with the same culture he sought to evade? 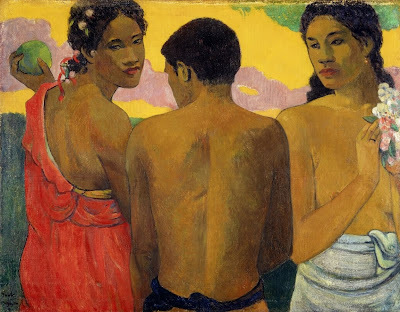 The missionary mindset that took root in the islands was a tentacle of European culture that Gauguin was always battling with - more repulsive energy. Charles Morice characterized it as a state of “siege”. The panels above his hut in Atuana, Island of Hiva-oa, Marquesas Islands read “Maison du Jouir” which translates as “House of Pleasure”. This was surely a stick in the eye for the local Catholic authorities. Also included on the carvings on the second story of his hut (his studio) were the sayings “Be Mysterious” and “Be in Love and You Will Be Happy”. 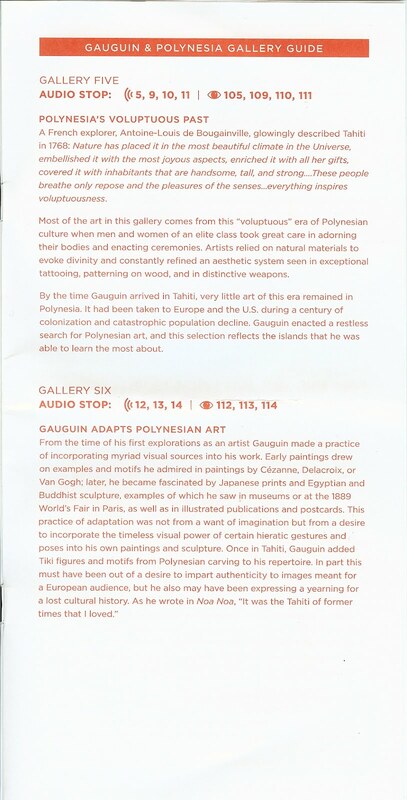 Some of the Maori carvings displayed toward the end of the exhibit are fantastic and inspired Gauguin. The “haliotis” referred to in the description of some of the carvings is abalone shell, the genus Haliotis. In the painting Vahine no te tiare or Tahitian Women with a Flower, 1891 the flower in question is a tiare flower, Gardenia taitenis (or Tahitian Gardenia). 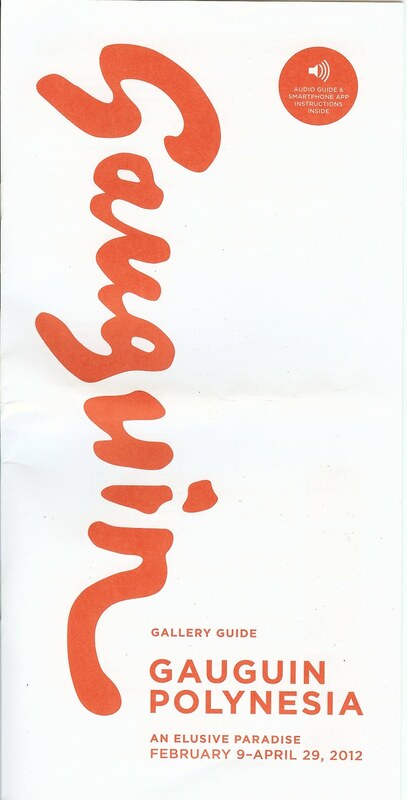 Noa Noa is the title of a book that Paul Gauguin wrote describing his experience in Tahiti. It’s fairly short and can be obtained at Project Gutenberg. The title means fragrance. Moai versus Maori. Moai or mo’ai (without the “r”) is a large human figure carved on stone found on the Polynesian Island of Easter Island between 1250 and 1500. Māori refers to the native or indigenous people of New Zealand, and Easter Polynesian people. 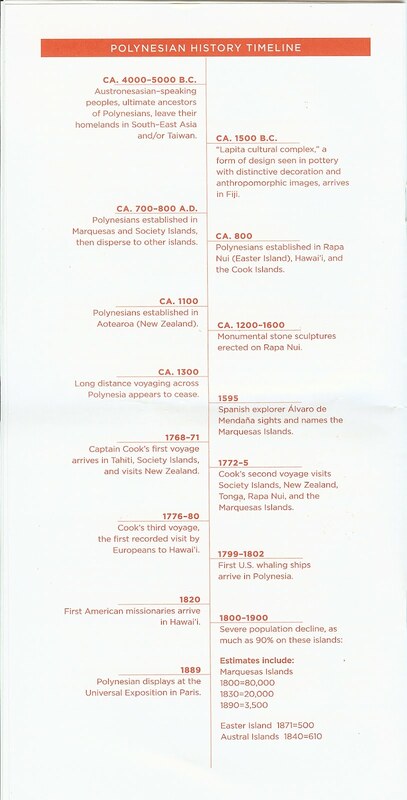 Also, Polynesia means “many islands” and is made up of over 1,000 islands in the central and southern Pacific Ocean. 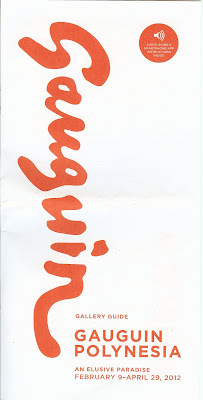 Gauguin’s masterpiece D’où Venons Nous? Que Sommes Nous? Où Allons Nous?” (Where do We come from? What Are We? Where Are We Going?) (1897) was painted during his second stay in Tahiti and just before he moved to the Marquesas Islands. This piece was discussed in the post Progress: Myth, History, and Origin. This quote resonated with me and was one of the things that helped change my mind about Gauguin as less “egoist and madman” and perhaps, more gentle sauvage.